Donation to no-man's land. for my army until i realized it didn't match the style. Wreck it up. maybe my army can make a reference to it. Looks better then the blue. I also suggest something to bridge some of the gaps for armies without jetpacks. Maybe some fallen alien trees or vines. I like it. And is that a Mandalorian in the bottom left corner? New map from me. Anything I should add or modify before I say it's finished? Also, it's supposed to be an abandoned battlefield. There were tanks, helicopters, mounted guns, trenches, explosions, and people. (06-19-2013 07:59 PM)Agent link Wrote: New map from me. Anything I should add or modify before I say it's finished? Its a nice well made map, but it needs more... map. As it stands its just a flat plane which isn't interesting to fight on. I made a hotel. Thinking of doing a sequel to one of my FP rps. Yeah, agent, your map is really small and linear, give it some more varied pathways and it'll start looking nice. Looking like a good hotel apples, good overall shape of the hotel. I'd sure like to see another large urban map! I have to admit, some of the larger details use vector-traces as a base for it, but I really don't see anything wrong with doing it. (06-20-2013 06:20 PM)SpartanApples link Wrote: Love it. Thanks, but to me the rooms I have done look a little blank and... cramped. Anyone have any idea on how to deal with this problem? Well I always have the problem of do I add lots of props and detail, so it looks pretty but is harder to play on. Or less so it's easier to play but looks a bit stupid. There isn't really an answer, just a preference. (06-20-2013 09:34 PM)SpartanApples link Wrote: Well I always have the problem of do I add lots of props and detail, so it looks pretty but is harder to play on. Or less so it's easier to play but looks a bit stupid. There isn't really an answer, just a preference. (06-20-2013 12:42 AM)Mr.Fahrenheit link Wrote: Yeah, agent, your map is really small and linear, give it some more varied pathways and it'll start looking nice. I'll post an updated version before the weekend, going fishing with my friends. I've extended the math both horizontally and vertically. 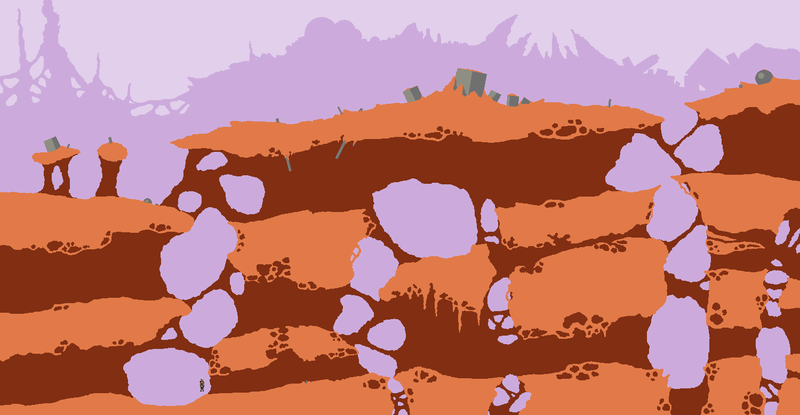 I'll be making a more efficient way to get between levels, adding more props, and adding more rocks to the dirt. Any other ideas are appreciated. It's better... but it's still very linear. From the looks of it, there are 3 levels to it and only 3 ways to get from the top to the middle layer, with none from the middle to the bottom. Thus there are only 3 ways to get in and out of sticky situations, and those 3 require jetpacks. Also, I predict that you may say 'The bottom layer is just for show'. Well, if it is just for show, what is the point of it being there? You could make it useful and actually do something with it, but if it's just for show then what's the point? But I'll be making platforms, ladders, stairs, and elevators to get to each of the layers. The third layer is going to have a tower on the right side, and I'll be making it look less smooth. No I know. Just giving you tips on how to go about it. Okay. I'm also not posting until I get back in 2-3 days, currently waiting for a phone call. It's beautiful. I can't wait to see more floors. Edit: Also, I just saw your Hotel above it, Spartan. Looking good. Some Facepunch oldies might recognise what this map is a sequel to. Would anybody be interested? I still have to add details to the map and make some more sprites, but I don't think this forum has even had an RP yet and this is a combat orientated one so it should be pretty good. (06-22-2013 12:34 AM)SpartanApples link Wrote: Would anybody be interested? I still have to add details to the map and make some more sprites, but I don't think this forum has even had an RP yet and this is a combat orientated one so it should be pretty good. Oh god yes I would. But RPs tend to die before their conclusion. Besides that one with S.P.A.T.U.L.A and the gripping conclusion of the starship blowing up. The nostalgia is killing me. I remember you giving an actual name to S.P.A.T.U.L.A. And this has been bugging me for the 3 years I've not been on here. What was that again? Something like Security Protocol Something Something User-Learner Android.